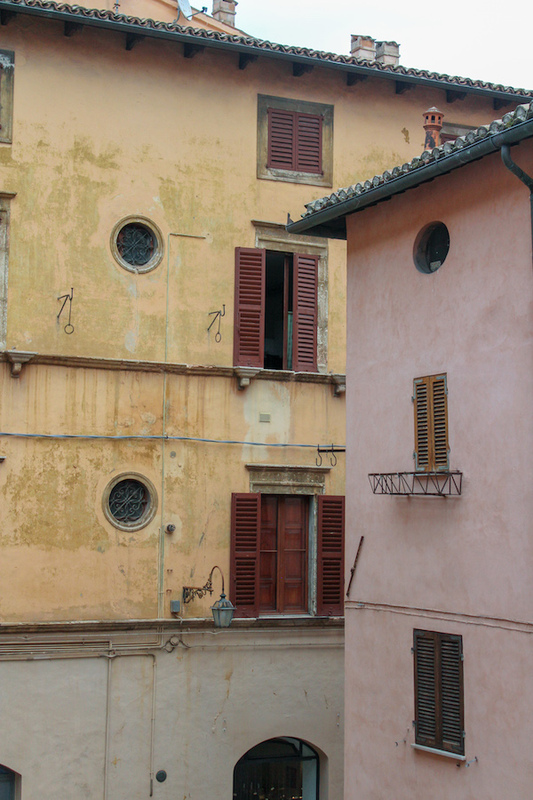 There’s more to Italian culture and wine than Chianti and Barolo. As Italy’s most famous cities – Rome, Milan, Venice – and her better-known wine regions – Chianti, Brunello, and Barolo become more and more crowded with tourists, it’s time to consider touring her less-buzzy, hidden gems. One of my favourite lesser-known regions is the gorgeous and fascinating Le Marche, with its beautiful Adriatic Sea coastlines, white sand beaches, outstanding produce and restaurants, and of course, its unique wines. Pronounced La Mar-kay, La Marche lies between Emilia-Romagna to the north, Tuscany and Umbria to the west, and Lazio and Abruzzo to the south. Most of the region is hilly to mountainous, with a continental climate of cold – often snowy – winters, making it a great place to grow grapes. La Marche boasts 20 denominations: five DOCs (Denominazione di origine Controllata – an important quality assurance label for Italian wines), 15 DOCGs (Denominazione di origine Controllata e Garantita – the highest level of Italian wine appellations), and 1 IGT (indicating high quality Italian “table” wines that could not meet the DOG or DOCG). Of these, 52% are white wines and 48% are reds. 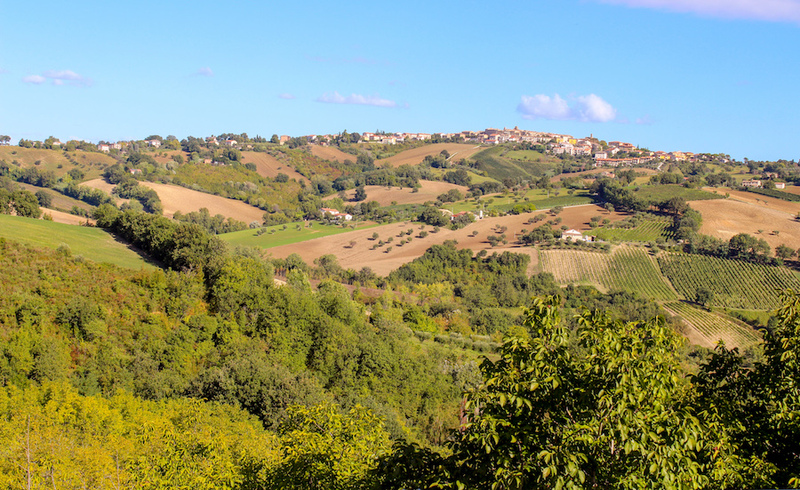 While traveling in Le Marche with a group of sommeliers and wine writers, I had the pleasure of experiencing first hand, the flavour of the La Marche terroir. I am very excited to share some of the wines I tasted, and encourage you to get out there and try them for yourself. Even if you can’t make it to La Marche, a visit to your local wine store can take you part of the way there! Verdicchio is one of the most widely planted grapes in Le Marche – it has been grown in the area for more than 600 years – and is the grape behind two DOC wines: Verdicchio dei Castelli di Jesi and Verdicchio di Matelica. The name Verdicchio derives from verde (green in Italian), and refers to the slight green-yellow hue that wines made from Verdicchio can have. Tasting Verdicchio, one will often find fascinating notes of the sea, limestone, and seashell, and it’s the sort of grape that is enjoyed and employed in Le Marche in several different ways. 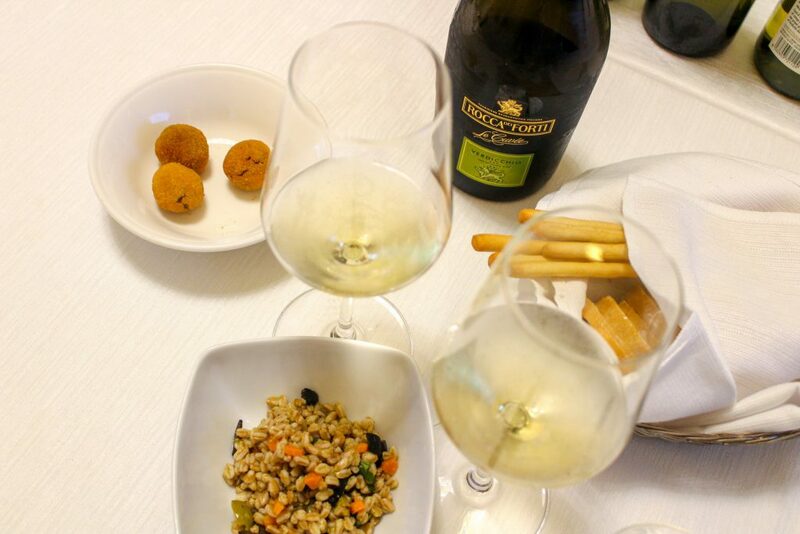 Verdicchio is a spectacular grape for creating sparkling wines as it features wonderful freshness and acidity which are essential to a great, well-balanced bottle of bubbly. 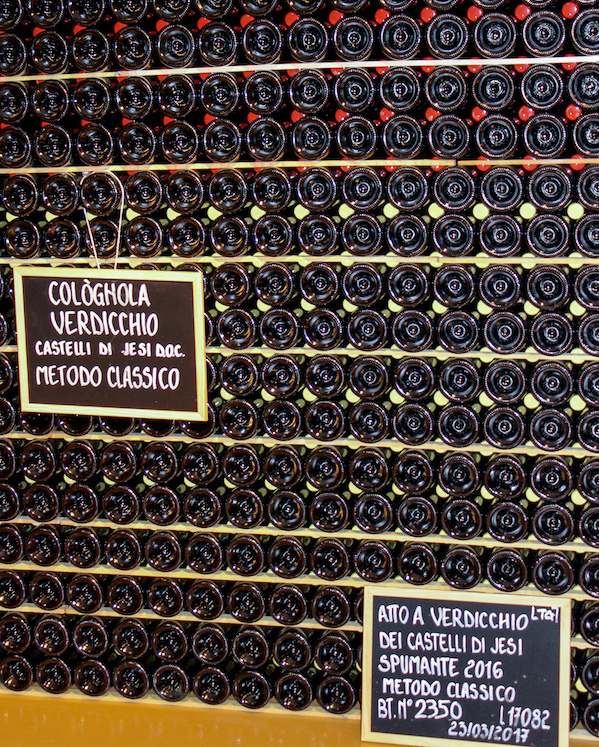 The Garofoli winery was one of the first to make sparkling wines from the Verdicchio grape; starting in the 1950s, using the Charmat method, switching to the Traditional method in the 1970s. Now, they are making not only white sparkling wines but beautiful rosés as well. Most Vedicchios should be consumed within the first five years after release, but there are some great examples of age-able Verdicchios. Verdicchio can maintain its acidity for up to a year, and doesn’t oxidize. Even the colour of the wine doesn’t change much, which is rare for aged whites. One of the aged wines I tasted is from Cogolognola Tenua Musone – Labieno Castelli di Jessi Verdicchio Riserva 2007 DOCG. The winemaker aged 10% of the grapes on their skins in barique which is where the dark golden-orange hue comes from. It’s a bold wine with good structure and complexity. Another interesting aged wine I tasted is Garofoli Podium Verdiccxhio di Castelo di Jessi 2008. It showed like an old Burgundy but at a much better price point. And, while still being very fresh, and not showing much of a colour change, it could keep on aging for up to a another seven years. This versatile grape is also used to create dessert wines called passito or ‘straw wines’. Passito means “dry”, and this wine acquired its name from the traditional practice of leaving the fresh grapes on straw mats to raisin in the sun – a process called appassimento – leaving the wizened grapes loaded with concentrated sugars and flavour. These are great wines to enjoy with a cheese course at the end of a meal, although they are quite hard to find outside of Marche. This magical, sparkling wine is the only wine in the world to undergo three fermentations, and it’s bottled in dry, off-dry, semi-sweet, and sweet versions. To create the sweeter wines, about 60% of the grapes are crushed and fermented, while 40% go through appassimento, the process whereby fresh grapes are dried out for a few months before crushing them for fermentation. After both finish their separate fermentations, they are combined in a stainless steel tank for a third fermentation which creates the bubbles. In the glass, you may find beautiful notes of cranberries, raspberries, and cooked red fruit, with some spice and well-balanced acidity. The sweet bubbles are spectacular with desserts and cheese. 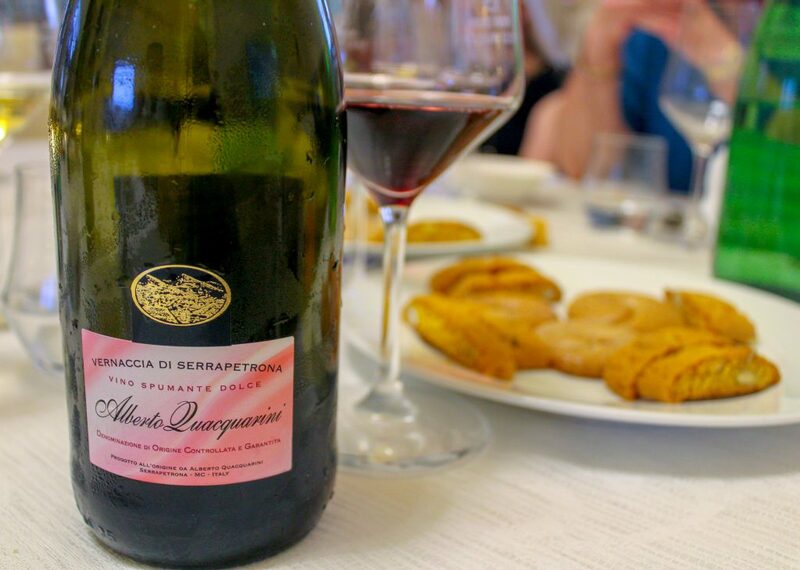 Rosso Conero – is made from at least 85% Montepulciano grape, while the rest is usually Sangiovese. The resulting wine must be a minimum of 12.5% alcohol, and is full-bodied, bold, and robust. Rosso Piceno – the largest DOC of Marche, with a high altitude of up to 2200 feet, these wines must be made from Sangiovese (30% – 60%), and Montepulciano (35% – 70%), while the rest may be Trebbiano and Passerina, resulting in a concentrated and bold wine, yet softer than Rosso Conero. Le Marche is so much more than tasty wines; it’s the olive trees, the artisanal shoemaking ateliers, it’s the natural ingredients that locals nurture and love. Their approach to viticulture is very traditional – you can taste that in the pureness of the wines, and what makes it even better are the lovely people who take part in expressing this unique region’s taste of place. 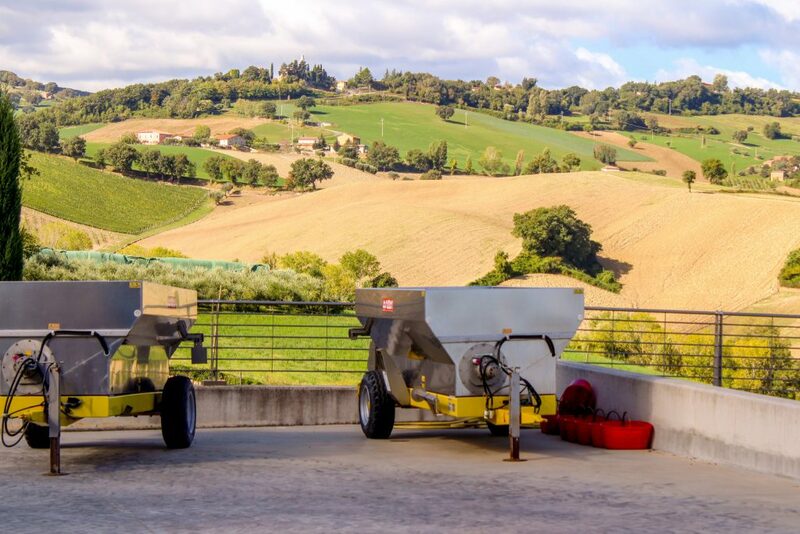 While being in Marche you can feel their deep connection with the previous generations of winemakers, their attachment to the land, and to their long-held traditions. 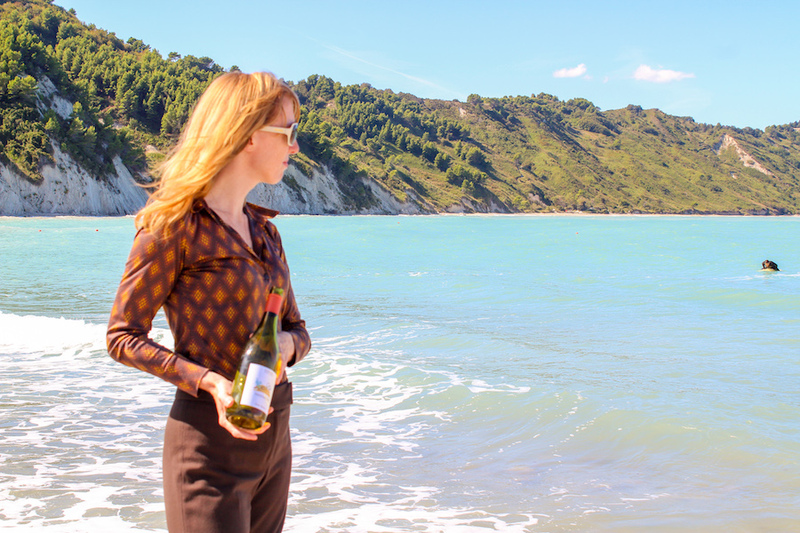 When I think about Marche wines, I imagine I’m back on that beach, watching the sun set over the Adriatic Sea, a bowl of mussels and shrimp in front of me, a glass of Verdicchio in my hand, and the magic of this place all around.